Hardcover, 9.5 x 11 in. / 432 pgs / 180 color / 350 bw. 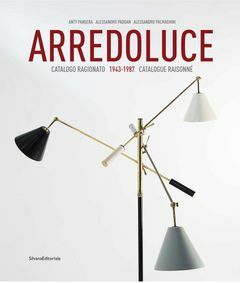 This book tells the story of the Arredoluce company, whose lamps and furnishing accessories helped to write the history of Italian design during the postwar industrial boom. Arredoluce was born in 1943 in Monza, Italy, through the initiative of Angelo Lelii, an entrepreneur and designer passionate about American culture. His curiosity about international trends in design innovation, love of traditional materials (particularly glass) and maniacal attention to detail all informed and characterized the products of the company over the years—many of which were developed with designers and artists such as Ettore Sottsass, and brothers Pier Giacomo and Achille Castiglioni. Today many of Arredoluce's lamps, defined by their visual weightlessness, are heralded as epitomes and paragons of midcentury design, and are extremely collectible. FORMAT: Hbk, 9.5 x 11 in. / 432 pgs / 180 color / 350 b&w.